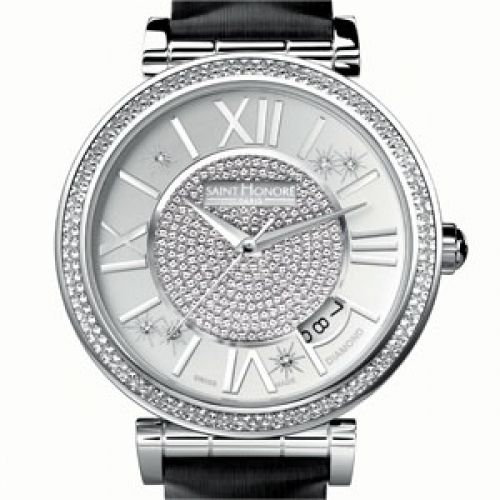 SAINT HONORE is exploring a new facet to femininity with Opéra, a watch and constant companion. Sophisticated or lightweight depending on the time of day or night, Opéra is a delicious mix of emotions and freshness. It personifies seduction through its blend of watchmaking know-how, play of materials, sizes and colours and the magic of diamonds. The totally-round case conjures up softness and femininity and underlines the exclusivity of this model with its two different versions - 33 mm and 37 mm. The case is extended for even greater comfort by movable horns that match the shape of the wrist perfectly. But the star attraction is without question the magnificent “Eclair” executions. 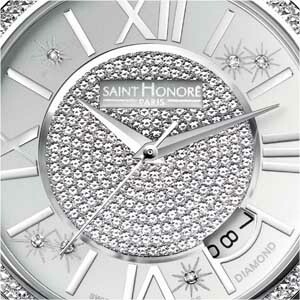 Loyal to its pioneering traditions, SAINT HONORE presents exclusively immensely precious bezels and dials, magnified by a unique "pavé of diamonds"-style work. These “Eclair” versions are truly exclusive and give Opéra an originality never seen before. The Roman numerals hovering between elegant and simple and their layout reveal a whole new type of classicism.